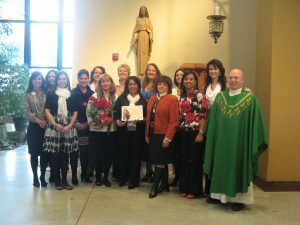 On Sunday, October 14, the first Sunday of the Year of Faith, 13 women from St. Anne completed their Marian Consecration at the 10:15 a.m. Mass. 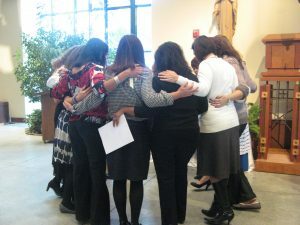 These 13 women studied, prayed and celebrated their consecration. If you’re interested in learning more about the program (they’d like to share with all! ), you may contact any of the women listed here. 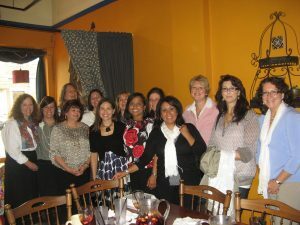 Sheryn Abraham, Linda Bevec, Sheri Clark, Lisa Craft, Esther Ficke, Kathy Hellwig, Maggie Hodge, Kathy Jalensky, Tracie Kenney, Margie Mandli, Anna Nuzzo, Chris Pillizzi or LeAnn Rogan. (To left: They prayed the Hail Mary after Mass). Celebrating at a luncheon with their families at Ole Madrid in Racine.